*Soulja Boy is facing two felony charges relating to the guns cops found in his house in December. The Los Angeles County D.A. just charged him with possession of an assault weapon and being a felon in possession of a firearm, according to TMZ. He was also charged with a misdemeanor for receiving stolen property, because one of the guns seized from the rapper’s house was stolen from a police car, authorities said. The assault weapon charge is for a Mini Draco AR-15, which is illegal for anyone to possess in California. If convicted Soulja – whose real name is DeAndre Cortez Way – could face more than four years in prison. 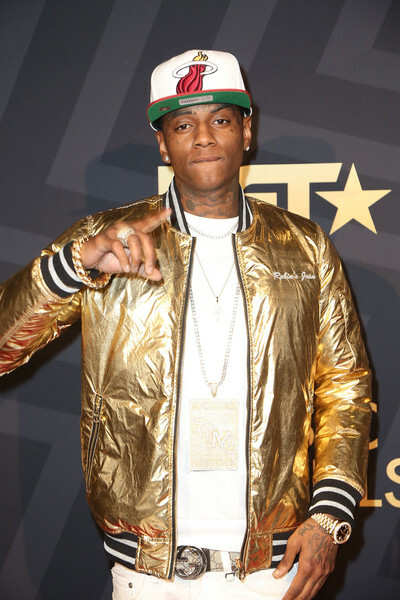 DeAndre Cortez Way, better known as rapper Soulja Boy, was charged today with illegally possessing firearms, the Los Angeles County District Attorney’s Office announced. Deputy District Attorney Michael Morse said Way (dob 7/28/90) of Studio City faces one felony count each of possession of an assault weapon, a Mini Draco AR-IS; unlawful firearm activity: felon in possession of a firearm, Glock 21 .45 caliber; and one misdemeanor count of receiving stolen property, a Glock 21 handgun. Arraignment in case LA085196 is scheduled today in Department 100 of the Los Angeles County Superior Court, Van Nuys Branch. The rapper was arrested at his house on Dec. 15 after police allegedly found him in possession of the firearms, one of which was reported stolen from a Huntington Beach police vehicle, the prosecutor said. Way faces more than four years in state prison if convicted as charged. If you’re wondering, the highly-anticipated Soulja Boy versus Chris Brown boxing match is still on and is scheduled to take place in March in either Los Angeles or Las Vegas. It’s anybody’s guess as to whether Soulja will be able to make it.